Fire and safeguarding bosses are calling for better warnings on emollient skin creams after the tragic death of smoker John Fallon in a fire. A campaign has been launched to alert the public to the hidden danger smokers could face when using skin creams containing paraffin. It follows the death of Lancashire care home resident John Alastair Fallon, 69, who died after accidentally setting fire to himself when smoking outside Alston View care home, Longridge, near Preston. Mr Fallon was using a skin cream to treat a burn he had suffered in a previous smoking incident. 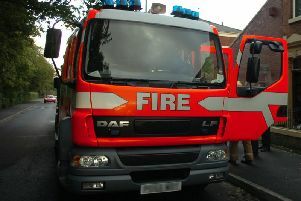 Now the Lancashire Safeguarding Adults Board and the county’s Fire and Rescue Service service say the public must recognise that such creams, typically used to treat eczema, dry skin and burns, can become impregnated in a user’s clothes or bedding –and the fabrics could act as a powerful wick if they come into contact with a dropped cigarette, flames or sparks. After a three-day inquest, coroner Michael Singleton concluded Mr Fallon’s was an “accidental death”. There have been at least three other cases across the country, highlighted in serious case reviews. Safeguarding Board chairman Jane Booth fears more tragedies could occur if smokers, carers and the general public are not alert to the risk. She is calling for labelling to be changed so that even creams with a small percentage of paraffin/petroleum are labelled with a fire risk warning. The campaigners are not identifying any particular cream as they say many contain paraffin and users or their carers need to check contents. While users of some creams may be advised by pharmacies and health professionals about associated risks, there is a concern that many people buy preparations over the counter from high street shops and just won’t be aware of the potential for danger. He said it is also essential that such risks must be listed in the main fire assessment risk book/list so that when staff change new staff recognise this is a risk for individuals. They should also be aware of the potential risk for staff and other residents who could find themselves trying to put a fire out. • The fire service can provide fire retardant bedding to those at risk and will carry out a risk assessment at people’s homes.